An office action is a document prepared and sent by an examiner at the USPTO about any issues with your patent application. It is only one step in the overall process at the Patent Office. The office action will be sent to the person listed in the correspondence section of the Application Data Sheet that was submitted with the patent application. This article will go through the steps you might take to understand the office action and possible responses for common objections and rejections to your patent application. Options under a nonfinal office action? Options under a final office action? Step 8: How to file the response? Some inventors and startups receive a rejection of their patent application and take it too hard. They feel as if it is the end of the road for them and that the funds spent were wasted. At least for the initial rejection, this is not likely to be a waste. The proper perspective on rejections is important so that you do not get depressed thinking about it. If this is the first office action and your patent application has been rejected, the rejection in and of itself is not a reason to abandon the patent application process. The rejection is just the opinion of the examiner. Of course, the examiner’s opinion matters the most but that does not mean that you do not have options. See Step 4, below, on what you can do to respond to the office action and convince the examiner to change his or her mind. However, the rejection in and of itself is not the end of the road. Even if you cannot convince the examiner, you can appeal the case to the Patent Trademark and Appeals Board. My recommendation is that you not get discouraged and that you retain good counsel so that you know your options. The USPTO’s own statistics show that a rejection on the first office action is not a significant indicator in terms of final allowance of the patent. The rate of rejection on the first office action is about 90%, whereas the allowance rate for utility patent applications run around 50% to 60%. This means that ½ of all patent applications are allowed and issued as a patent after most of them are initially rejected. Once again, be positive and know that you are not necessarily at the end of the road. In fact, you may have just begun the real part of the examination stage of the patent process. The due date to respond to the office action will be explained in the first paragraph of the second page. The time period for filing a response may be one, two or three months from the mail date of the office action. The mail date is located at the upper right quadrant on the first page of the office action. See the example below. The actual time period to respond to the office action is located in the first full paragraph on the second page of the office action. See the example below. The explanation of the various due dates and time periods may refer to a shortened statutory time period. The statutory time period for responding to an office action is generally six months from the mail date. However, the patent office may shorten that statutory time period to one, two, or three months. This is why the office action will refer to a shortened statutory time period for responding to the office action. If a response is filed within the shortened statutory time period, then there is no governmental fee. If a response is filed after the shortened statutory time period, then an extension fee must be paid based on the number of months after the shortened statutory due date. The extension of time fee is paid at the time the response is filed. For example, if the response is filed two months after the shortened statutory time period, then a two-month extension fee is paid when the response is filed. You do not need to pay the one-month extension of time within one month after the shortened statutory due date has expired. The issues dealing with the form of the patent application are generally easy to overcome. They may be time consuming to fix but fixing the formalities is generally straightforward. Steps on dealing with the common formalities are discussed in Step 6 below. The issues dealing with the substance of the invention require an understanding of the law and the facts. Steps on dealing with the common substantive issues are discussed in Step 7 below. Warning: If you are trying to respond to the office action without the help of a patent attorney, then you need to be careful that you do not amend the specification or the claims or make arguments that will unduly narrow your claims so that they would be easy to design around. Warning: If you are not represented by an attorney, then the examiner will help you respond to the issues. However, based on my experience, they do not help you with the scope of the claims. Many of the suggestions by examiners that I’ve seen narrow the claims and patent protection too much. An Action on the Merit (AOM) occurs when you receive examination that deals with the substantive issues of the invention. The first action on the merits (FAOM) determines how you need to comply with your duty to disclose under MPEP Section 609.04(b). The FAOM also determines how the examiner is graded for productivity purposes under MPEP Section 1705. Once you receive an office action, you have a few different options to convince the examiner to change his or her mind. The Patent Office requires a written response to an office action. See, 37 CFR 1.2. If you talk to the examiner or the help desk at the patent office, that is not a satisfactory response. You must put your response in writing and submit it to the Patent Office. Even though you must submit a written response, you can call the examiner on your case and talk with that person. See, MPEP Section 713 (Interview). I’ve found that these telephonic interviews are very helpful in expediting a mutual understanding of the invention and the examiner’s interpretation of the prior art and claimed invention. Written communication is oftentimes not as efficient and one does not have the instant feedback that occurs during a telephone call. Written communication is necessary so that the public has a record of what arguments you made. To facilitate the interview, a draft response is provided to the examiner which is used as talking points. The draft response should be submitted informally to examiner either through email or fax. Related Article: How to prepare and conduct the telephonic interview? An in-person interview is also available. However, they are expensive to conduct because of the time involved to travel to the examiner. I’ve found that telephonic interviews are highly effective, given their relatively low cost compared to in-person interviews. You can also do a web conference with the examiner but they do require special setup and coordination. I generally recommend conducting telephonic interviews unless it would be extra helpful to have a web conference or in-person interview. You are normally allowed one interview before your office action becomes final. If you have not conducted an interview before a final office action, the examiner normally allows you to have one interview after the final office action. The written response may include arguments and amendments to the claims. The arguments support the case for patentability of your invention. The written arguments provide the reasons that the examiner should change his or her mind. If claim amendments are made then the written arguments should explain the claim amendments and how they overcome the rejection. After the telephonic interview is conducted, the written arguments and claim amendments may be formally submitted to the examiner through EFS-web after conducting the telephonic interview. The examiner’s feedback is incorporated into the formal response to the office action. Oftentimes, amendments to the claims are made when responding to a rejection based on novelty or obviousness. Even if you don’t think that the examiner is correct, you may still have to amend the claims. The reason is that it is difficult if not impossible to actually convince an examiner or someone else of anything. Rather, a useful perspective is that you are really providing new information (i.e., narrowing of the claim scope) so that the examiner can make a new decision. In this way, the examiner is not having to be convinced of anything. Additional evidence can be made of record in the prosecution of the patent application. For example, a declaration of the inventor can be made of record to establish a fact or an understanding of how one of ordinary skill in the art might understand a particular phrase or term of art. Test data, unexpected results, commercial success, solution of a long-felt need, and inoperability of the prior art can be submitted as additional evidence. See MPEP Section 716.01(c). If you believe that you have a particularly difficult examiner, I’ve seen requests for a new examiner. However, I’ve never seen one approved. Additionally, taking a step back from the situation, asking for a new examiner is not conducive to a good working relationship with the examiner because you would have to explain why the examiner is not capable of examining your patent application. I recommend working with the examiner through written correspondence and interviews. Be agreeable and responsive to the examiner’s request. Another common request that inventors ask is whether they should get the examiner’s supervisor involved. Unless your examiner is a junior examiner, then asking for their supervisor would be an insult. You would be dealing with a primary examiner or a supervisory patent examiner. They have full signature authority on a case. A junior examiner does not. Even if your examiner is a junior examiner, I’m generally of the opinion that it is better to have the junior examiner make the call as to whether his or her supervisor should get involved. If no agreement can be reached between the examiner and the inventor, then an appeal of the case could be made to the Patent Trial and Appeal Board. See MPEP Section 1200 (Appeal). The costs are significant but if the examiner and the inventor cannot come to an agreement, then this might be the only option to adjudicate the difference in opinions. It might actually be less costly too, especially if the examiner’s position is entrenched and the inventor has the facts and the law on his or her side. To determine if the office action is final or nonfinal, look on the second page of the office action. It provides a summary of the office action and has a series of check the box options for the examiner. When the office action you are responding to is a non-final office action, then you have all of the options available to you including but not limited to everything in Step 4. Written arguments and claim amendments can be requested as of right from the examiner. Generally, the second Office Action on the Merits will be a final office action. MPEP Section 706.07. If you are responding to a final office action, then the examiner’s work is essentially finished. The examiner does not need to consider additional claim amendments and remarks that you might submit in a formal written response. You only have a few options moving forward. You may be able to request a telephonic interview. I’ve been quite successful in requesting these after the final office action. If so, you would be able to submit a draft response for the examiner’s consideration. You could submit a formal response with all of the arguments and claim amendments but most likely the examiner will not review them nor enter them into the record. Sometimes after a final office action, the examiner will allow you to submit minor changes that require additional consideration by the examiner if the examiner feels that the patent application is close to an allowance. You can formally request consideration after the final office action through the After Final Consideration Pilot 2.0. I normally preclear this with the examiner during an examiner’s interview. 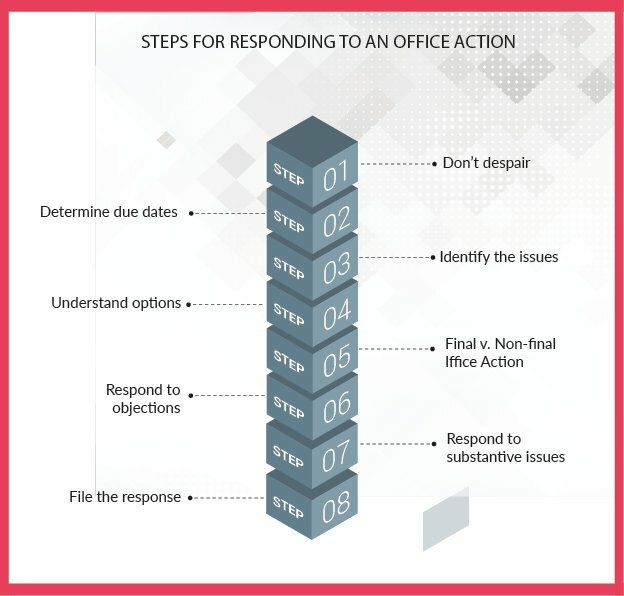 After a final office action, a written response must be filed with a Request for Continue Examination and the appropriate extensions of time before the end of the six-month deadline. Otherwise, the patent application will go abandoned. Alternatively, you can also file a continuation patent application. A restriction requirement from a layperson’s perspective is merely an opinion of the examiner that the claims presented in the patent application can be categorized into more than one group and that the inventor needs to select only one for examination. The basic point here is that you want to elect one of the inventions identified by the examiner. Many inventors feel as if an examiner doesn’t understand the invention because in the inventor’s mind there is only one invention not two or more. Inventors need to understand that the examiner is more likely right than wrong. Plus, arguing with the examiner will not be cost effective. It is just better to elect one of the inventions and move on. Now, if the examiner really did divide various embodiments of the invention incorrectly, then I would recommend calling the examiner and requesting a different division of the embodiments. Nevertheless, I recommend still electing one of the inventions. Antecedent basis issues in the claims relate to a simple rule that a component must be first introduced with the article “a” or “an” then every following instance of the component must be referenced with “the”. If a component is introduced with the article “the”, then the examiner will give you an antecedent basis objection. All that needs to be done is to change “the” to “a” or “an”. Specification issues generally relate to whether all of the figures have a corresponding figure description in the Brief Description of the Drawings section. If not, the patent specification needs to be amended to include one. The trick here is to introduce a figure description that is generic enough so that you don’t get a follow-on new matter rejection. Put simply, the new figure description needs to be generic enough that the description itself isn’t adding any additional information than what is shown in the drawings. The patent rules require each claim limitation to be shown in the drawings. If the examiner objects to the claims based on this issue, then the claim limitation needs to be removed from the claim section or a generic figure needs to be inserted into the drawing set. Since 2014, the USPTO and the courts have invalidated numerous software patents as being abstract ideas. Abstract ideas are ineligible for patent protection under Section 101. Alice v. CLS is the seminal case that started the entire movement in rejecting software inventions. In its wake, certain diagnostic tests have also been deemed ineligible for patent protection. Fortunately, mechanical-based inventions are still eligible for patent protection. A double patenting rejection is a rejection based on the fact that the claims of the current patent application are similar to or the same as a separate patent owned by the same applicant. In some circumstances, the separate patents can have different dates on which they terminate or expire. The USPTO does not want separate patents with similar or identical claims having different expiration dates. If the claims being examined are similar to the claims of a separate patent, then a non-statutory double patenting rejection will be given. In this instance, a terminal disclaimer (i.e., preferably an eTerminal Disclaimer) is normally filed which will overcome the non-statutory double patenting rejection. More information about eTerminal Disclaimer. If the current claims are the same as the separate patent, then a statutory double patenting rejection will be rendered. A terminal disclaimer cannot be used to overcome the statutory double patenting rejection because the USPTO does not want two separate patents with the same claims. A novelty rejection occurs when the examiner shows that a single reference contains all of the limitations or elements of a claim. The cited reference is said to anticipate the claimed invention. The claimed invention is not novel. Novelty and obviousness rejections are the two most common rejections that the examiner will make against a patent application. The key to understanding to responding to these types of rejections is understanding the Broadest Reasonable Interpretation standard. The broadest reasonable interpretation allows the examiner to attribute a meaning to a word which is broader than what an expert or layperson would think that the word might mean. “Bicycle pedal” might encompass any type of foot support. “Trigger” might encompass any type of actuator. On-off button might encompass any type of mechanical device, electronic switch or software program that turns something on and off. Once you understand that the claims of your patent application are being interpreted this broadly by the examiner, then you can start to understand why the examiner might think that the prior art references cited by the examiner are related to your invention. The simplest way to resolve the issue is to think up of narrower terms so that the claimed invention avoids the cited prior art but yet is broad enough to make it tough to design around the claimed invention. An obviousness rejection occurs when the examiner is of the opinion that it is obvious to combine the teachings of two or more references to come up with the claimed invention. Section 2100 of the Manual of Patent Examining Procedure has a complete explanation of obviousness. Once a patent application is filed, new concepts and information cannot be added to the patent application. As such, if you want to claim some aspect of your product that is not described in the patent application, unfortunately, you cannot do it. If you try to claim an undisclosed aspect of your product, then the examiner will render a new matter rejection. The newly claimed subject matter will have to be deleted from the claims to overcome the new matter rejection. The response to the office action must follow a specific format. The first page of the response identifies the patent application by its serial number, filing date, title of the invention, art unit, confirmation number and the name of the examiner. The amendments to the specification, claims and drawings each start on a new page if any amendments to these sections are made. When amendments are made to the specification and the claims, strikethroughs represent deletions and underlining represents additions. For the drawings, an annotated sheet may be submitted with a clean copy of the sheets to indicate what is being changed. After the amendments are made, then the Remarks Section provides an explanation of why the patent application should be allowed and a patent granted. The arguments should match up with the claim amendments and explain why those amendments overcome the examiner’s rejections. Attached is a sample response which illustrates the format for the response to the office action. When a response is drafted and ready for submission to the USPTO, it is normally done through EFS-Web. How not to write the background section of a patent application?